When you go with the 2017 Ford Mustang, you get plenty of choices. This sports car comes in V6, EcoBoost and GT models that can be either fastbacks or convertibles. That means whatever kind of power and performance you desire, this vehicle delivers. It also serves up plenty of conveniences and comforts, with Premium versions of the EcoBoost and GT adding, even more, luxuries into the mix. You get the choice of three different engines, which line up with the Ford Mustang models. The V6 features a 3.7-iltre naturally-aspirated engine that produces an impressive 300 horsepower and 280 lb.-ft. of torque. Sequential multi-port electronic fuel injection helps with efficiency, without sacrificing any fun. EcoBoost models use a turbocharged 2.3-litre inline 4-cylinder engine. Thanks to a twin-scroll turbo that divides the exhaust runners into two chambers, you don't endure any lag when pressing on the accelerator. Instead, the full 310 horsepower and 320 lb.-ft. of torque are always at your command. The hardest-hitting of the bunch, Ford Mustang GT models pack a potent 5.0-litre V-8 that pushes out 435 horsepower and 400 lb.-ft. of torque. Even better, it gives off a deep, almost primal rumble when idling, which increases to turn plenty of heads at wide open throttle. Both a 6-speed manual transmission and a 6-speed automatic are available for all three models. Rear-wheel drive is standard. GT models with the manual transmission also feature launch control, so drivers can always execute a clean and smooth start from a standstill. All GTs have electronic line-lock, an innovation that locks the front wheels and not the rear, so warming up the tires at the track is simple and safe. If you want even more performance, Ford offers Performance Packages for GT and EcoBoost models. For the EcoBoost, the car gains summer-only tires, special aluminum wheels, unique chassis tuning, etc. Among the upgrades exclusive to the GT are six-piston front Brembo brake calipers, plus bigger rotors. Enhancing the Ford Mustang are plenty of innovative technologies. All models come with Track Apps. They take the hassle out of measuring various performance metrics, such as longitudinal and lateral g-forces, acceleration times, countdown starts, etc. Some technologies increase safety. Blind spot monitoring warns the driver when another vehicle is outside of view, thanks to radar sensors. Adaptive cruise control automatically slows down as traffic does the same, resuming the preset speed once conditions return to normal. While plenty of nostalgic designs grace the exterior and interior of the Ford Mustang, you also enjoy quite a few modern luxuries. All models feature air conditioning, power locks, power windows and an advanced infotainment system. If you want more, EcoBoost Premium and GT Premium models come with leather upholstery. The front seats are heated and ventilated, so you stay comfortable all year. Drivers enjoy power lumbar support, perfect for longer trips. 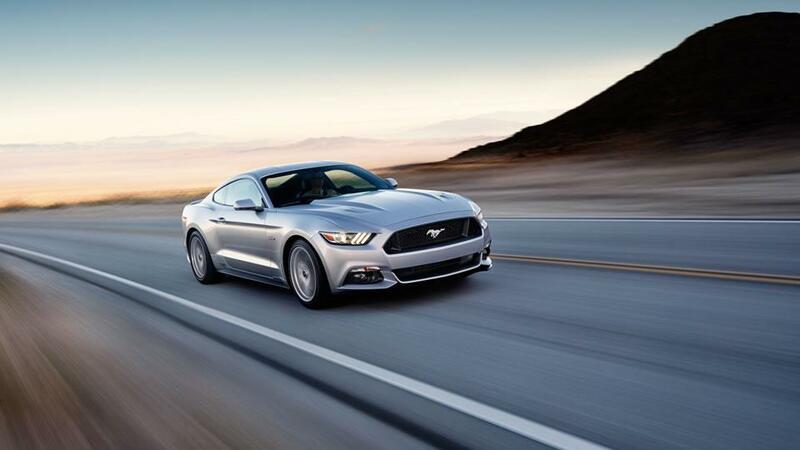 Schedule a test drive and check out the Ford Mustang by contacting us. ﻿Schedule a Test Drive Today!